How Couvre Porte will look after the project's completion. The approach to Couvre Porte in Vittoriosa is to be spruced up in a new project announced today by Resources Minister George Pullicino. 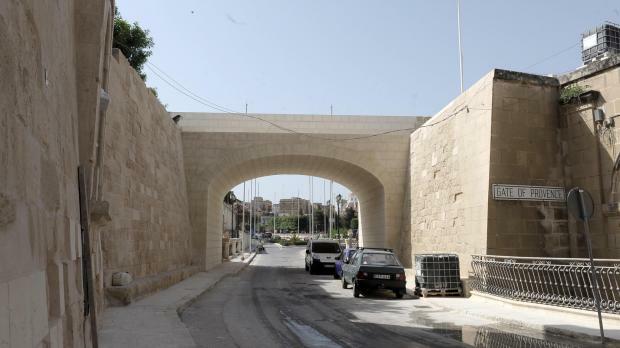 His ministry recently built an arch over a breach in St John Bastion where a road leads into the ancient city. The minister said today that the project is to be followed up by the removed of a considerable amount of debris which had practically filled in a small ditch in front of the counterguard, diminishing its importance. The area currently used as parking will be paved and the parking spaces will be moved closer to the road. The project is part of the wider project for the rehabilitation of the bastions. Dr Stephen Spiteri, superintendent of the historic fortifications, such a section of the bastion which existed at the time of the Great Siege was uncovered during works and would be preserved. Mr Pullicino said the new project will enable the Maltese and tourists to better appreciate the bastions. Families will also be able to enjoy the space created when the ditch is re-excavated.